I thought it might be fun to show how I paint a page of my book from start to finish. I know I’m always curious about how artists work, maybe you are too. This is the rough sketch from my dummy. There’s actually tons and tons of work that goes before this, lots of rewrites and redraws and rethinks which are ZERO fun to look at. Let’s pretend for our purposes that this is where things begin! This sketch is done digitally in Photoshop. Watercolor requires lots of planning (at least for me!) so I figure out my colors digitally before I start painting. See how the Little Guys each have a letter next to them? There are 25 of them, each distinct, and they all have to be in each spread, so I had to “take attendance” on each page and make sure they’re painted the right color. It’s time to get off the computer! 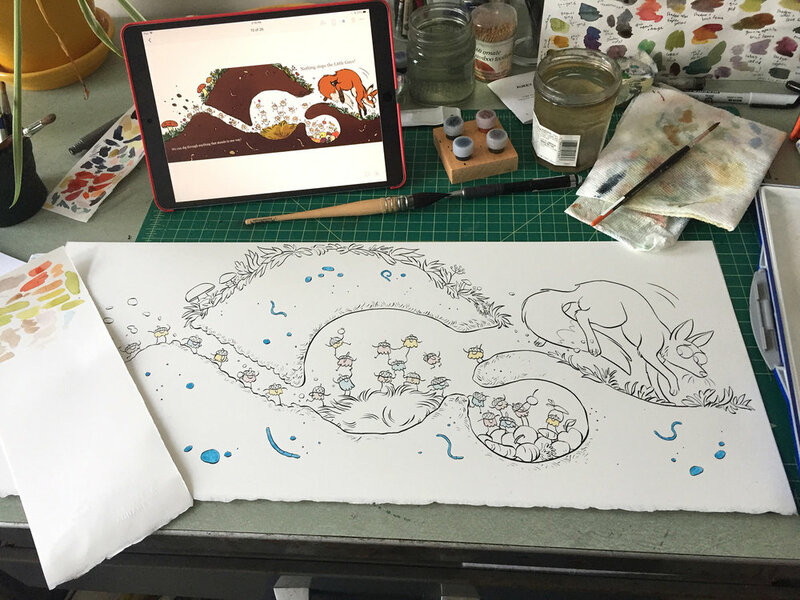 Using an LED lightbox, I transfer a printout of my digital sketch onto watercolor paper. I work actual print size - I think the paper is 12”x24”. This is what I ink with - a dip pen with a G-nib in it, and FW acrylic ink. 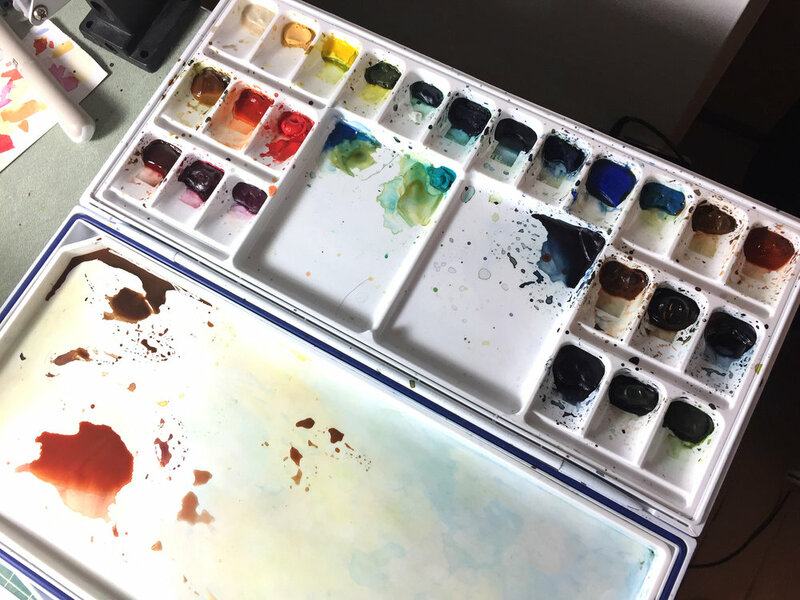 I decant the ink into these little things called Dinky Dips, which are the perfect depth for just getting your nib in there and not making a big mess. I love Dinky Dips. This ink is also great because it’s completely waterproof, and there are tons of colors so you can mix up just the right shade. I made my own dark green for this book. Time to paint! Do you see those blue areas? That is masked off with one of these Molotow Masking Pens. The paint won’t stick to those areas, preserving white paper underneath. I mask off small detailed areas (like earthworms) so I can do big washes without worrying about having to paint around them. You can also see that I have the digital color sketch up on my ipad in front of me for reference. I want to get close to my digital colors, since I know I like them! I don’t like having to think too much while I’m painting. This is my palette - plastic, lots of mixing area. I use tube paint squeezed into the wells, mostly Winsor & Newton and Daniel Smith. I have LOTS of colors but for this book I didn’t use all of them. The fewer colors I use the more unified my paintings feel, I think. Also mixing is really fun. This was my ACTUAL palette for this book. Since it’s set in the forest there are looooots of greens, which means lots of blues and yellows. Not much red at all. Before I started painting I mixed a bunch of test swatches and labelled what went into the ones I thought were pretty, so I would know how to recreate them. I kept this swatch sheet up on my desk too, to refer to. This is a fun exercise to do sometimes, especially when I buy a new color and want to see how it works with what I’ve already got. Further along here. I’ve got the big brown wash down for the earth, but it’s not dark enough. I went back over it again to deepen it up. Now it’s time to erase the masking fluid. I use this little rubber cement guy. It’s super fun. I did not take a photo of me painting the worms and rocks in because… I forgot. But that was the very last thing I did. Then I scanned the painting in, cleaned it up a little bit, and added the text. This is how it looks in the book. As I finished each spread of the book, I pinned them up on a corkboard in my studio. It was nice seeing it fill up as I got more and more done. Oh, and this is kind of interesting (to me): I painted this twice. The first time was on Arches Hot Press watercolor paper, and I didn’t like how granulated (grainy) it looked, and how it made the blue masking fluid smear when I erased it. You can see it on the right. So I switched to Fabriano Artistico Hot Press paper (left), and liked how it looked MUCH BETTER. So I repainted all the spreads I’d done up to that point. See the difference? Maybe you like the granulated one better! That’s cool. That’s why it’s important to experiment with different materials and figure out what’s going to work best for the effect you want. Art materials are a very personal decision. Hope you liked seeing mine!